If you have plantar fasciitis you want the pain to go away, but what will help? Physical therapy has several options! It’s a pain I can relate to, sliding out of bed, immediately greeted by heel pain and having to make an awkward painful shuffle to the coffee maker. Usually my heel pain goes away after my first couple steps and as long as I make a smart shoe choice for the day I’m good to go, but others aren’t as lucky. If you’ve never suffered from plantar fasciitis consider yourself lucky, but if you’re one of the more than 3 million cases of plantar fasciitis that occur annually you don’t need to suffer any longer. Physical therapy may be the answer to your aching heels. First things first, what exactly is plantar fasciitis? 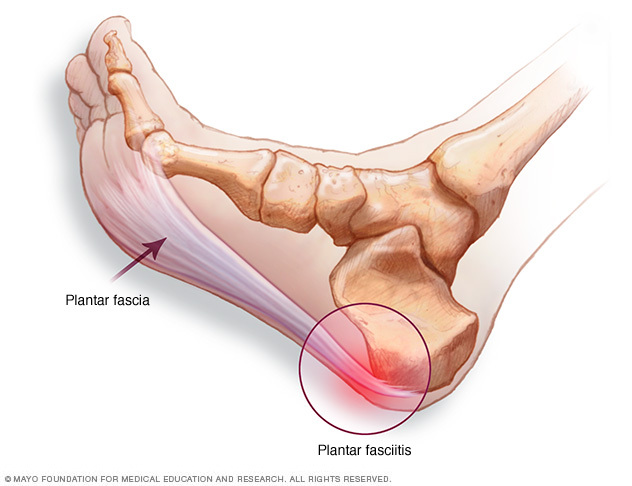 The plantar fascia is a thick band of connective tissue that runs along the sole of the foot and supports the arch of the foot. Plantar fasciitis occurs when this tissue becomes irritated or inflamed. Plantar fasciitis typically presents a couple different ways, most commonly as sharp heel pain, usually worst in the morning, or increased heel pain when weight bearing especially if you have been sitting or resting for a period of time. Some other symptoms that are less common are pain radiating from the heel, numbness and tingling. Iontophoresis- If you’re new to physical therapy I’m sure this is a term you’ve never heard before. Iontophoresis is a way to administer medication without an injection. A weak electrical current is used to draw medication through your intact skin to treat the irritated area. You might be thinking electrical current? That sounds painful! I can tell you from personal experience it is not, your therapist can adjust everything to your comfort level. Low dye taping- Taping of the foot can be helpful for pain relief as well as a determining if orthotics will be beneficial. The goal of taping is to support the arch of the foot as well as stop pronation of your foot. Lower extremity control- If your plantar fasciitis is caused by pronation of your foot, physical therapy can help with muscle control. The goal is to take pressure off of the plantar fascia by teaching you to pronate your foot less. Casting for custom orthotics- Your therapist can cast your foot for custom orthotics. Orthotics support your foot and can relieve your symptoms if you are pronating your foot or have flat feet. Cross friction massage- The goal of cross friction massage is to work on a specific area, your heel, focusing on the deeper structure of the muscles and fascia. Calf stretching and strengthening- Since one of the causes of plantar fasciitis is a tight Achilles tendon, working with a therapist on stretching, strengthening and increasing your flexibility can relieve your symptoms. Plantar fasciitis can be treated at home and there are several over-the-counter treatment options, but physical therapy still has it’s place. An accurate diagnosis and finding the cause of your symptoms is equally as important as the treatment. So if you’re suffering take a step in the right direction (pun intended) to rid yourself of heel pain. Soon you’ll be able to hop out of bed and get on with your day!